This past Sunday, I participated in the Terry Fox Run at High Park. Thanks to your generosity, we raised exactly $1,500.00. That's amazing! 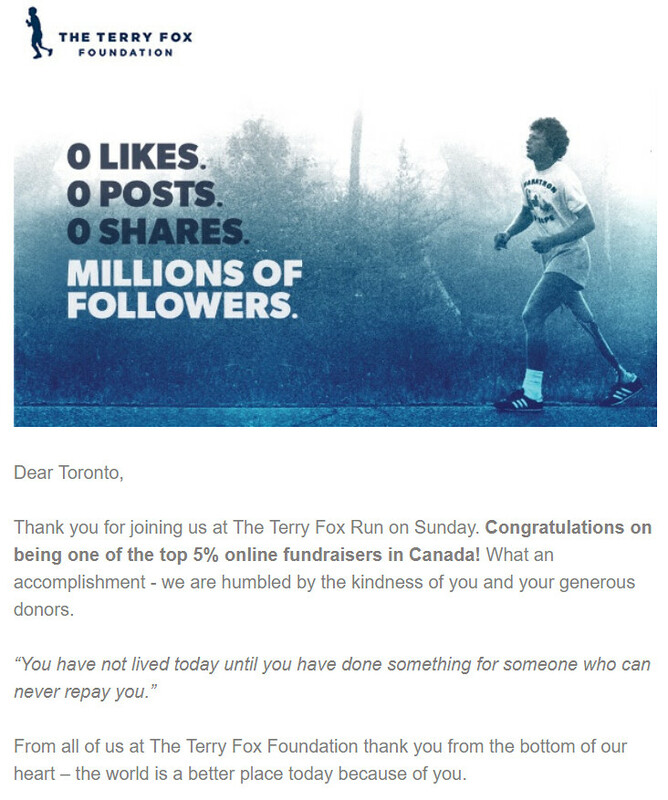 Yesterday, I received a Thank You email from the Terry Fox Foundation that blew my mind. The line that jumped out on me simply read, "Congratulations on being one of the top 5% online fundraisers in Canada!". Very impressive! It's great to be a part of the TM universe when you hear news like this. Well done, "Toronto". It's official now. Your name, that is. Toronto Jarvis wants no part of the group photo. You tripled your original goal of $500. Congrats. You'd be surprised how many emails I get addressed to "Toronto".